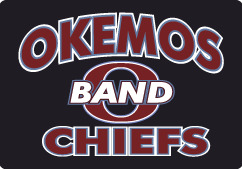 OKEMOS BAND apparel and accessories are now available to order online! IMPORTANT - BEFORE YOU ORDER! Please read all of the important ordering information that follows. ORDER DEADLINE IS TUESDAY, APRIL 30th. All orders will be held until the above order deadlines, then processed in bulk. Delivery will be approximately 2 to 3 weeks after each order deadline. Please note: WE CANNOT GUARANTEE DELIVERY ESTIMATES. Orders will be processed and delivered as soon as possible depending on current production time frames and product availability. We always do our very best to deliver all orders as quickly as possible. ALL ORDERS WILL BE DELIVERED TO THE BAND ROOM FOR DISTRIBUTION. IMPORTANT: ALL ITEMS ARE CUSTOM MADE TO ORDER. WE CANNOT TAKE ANY RETURNS FOR SIZE EXCHANGE OR FOR REFUND ON THESE ITEMS. PLEASE BE SURE THAT YOU WANT THESE ITEMS BEFORE YOU ORDER. PLEASE BE SURE TO ORDER THE CORRECT SIZE. There are no exceptions to this return policy for these custom made items. The size of the logos depicted on the pictures below is approximate only. We will use standard logo sizing for all items printed and embroidered. Most items may be customized with name on shirt back, or embroidered name as specified for embroidered items. You may CUSTOMIZE your item on the information page of that item.